Newbies would probably be better served by a host with a more structured support center and friendlier user interface. That said, if you know what you want and you know how to do it, Hostmonster offers a pretty good deal including lots of attractive features and eCommerce-tailored solutions. 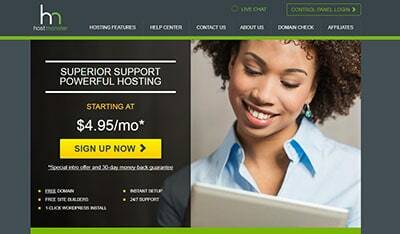 Hostmonster is a fairly unheard of web hosting company, and is part of a network of other hosting sites such as JustHost and BlueHost. The tangible difference between these hosting networks are the prices they offer, and the value you get for those deals. Generally, Hostmonster prices are reasonably low; and you are guaranteed great US customer service. That means no outsourcing customer support to other countries, which naturally makes their representatives easier to follow for American users. Want to know if HostMonster is right for you? I have no uptime stats to give you here as the site doesn’t offer any transparency to what kind of uptime it runs at. What they do say is that you will be guaranteed stable performance and most online reviews fall in-line with that statement. In terms of security there is 24/7 website monitoring, site backups and a UPS power backup which makes sure that you get high performance and the best in stability. With each plan offered you can also benefit from SSH access and IP deny which helps blacklist any potential threatening IP addresses. You can easily get lost in the list of 70+ features listed by Hostmonster. The basics include unlimited disk space/domains/emails and a lot more, but this is just the beginning. Apart from that you’ll get lots of ready scripts for eCommerce, blogs, media management. Which is specially exciting, you’ll get free search engine submission and $100 bonus credits for Google AdWords. The signup/setup process is relatively straightforward; however, they automatically select certain add-on features like SiteSecure at checkout, so you have to manually uncheck them or you will be charged. Hostmonster uses cPanel, the most popular hosting management tool used by lots of web host companies. The panel itself is packed with various optimization/customization instruments, however some of them may require a plan upgrade. The good thing is, Hostmonster lets you try their cPanel for free, so you’ll have a clear view on which functions you’ll get after the purchase. Hostmonster claims its support team is located in Provo, Utah, and that you will speak to a true American. Waiting times to connect with them on the phone are within reason. The Help Center has a fair amount of knowledge base articles, but a limited amount of videos, “currently being updated” and the User Forum is small. In short, their support has the same look-and-feel as its brethren BlueHost and JustHost –, i.e., assistance with basic problems but not too much further. While offering almost the same features as BlueHost and JustHost, HostMonster’s pricing is somewhere in the middle. Their introductory plan offers great discounts for a 3-year term commitment. 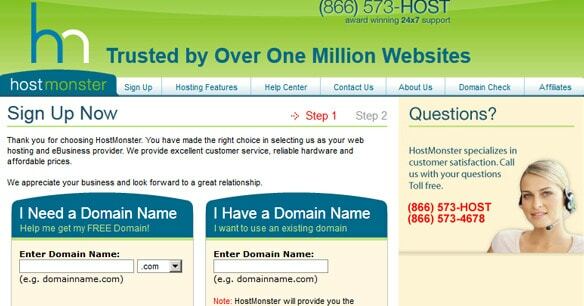 HostMonster offers a free domain, typical of many hosting sites. And while this hosting plan will satisfy most small/medium websites, HostMonster offers a pricier “Pro” version, which promises more resources (i.e. CPU) for larger heavily-trafficked websites. The registration procedure is quite clear and you will easily omit unnecessary extras. Another good thing about HostMonster is that you can have a 30 day money-back guarantee, although few customers apply for it. Hostmonster is a member of a group of sites owned by the same company, providing little distinction, aside from site design, as well as some price variations and their required length of contract. Newbies would probably be better served by a host with a more structured support center and friendlier user interface. That said, if you know what you want and you know how to do it, Hostmonster offers a pretty good deal including lots of attractive features and eCommerce-tailored solutions. Like This Review? Visit Hostmonster. Max is a Product Architect and Data Scientist. He teaches HTML, CSS, and JS to young web developers, and he wrote a few of the first guides to mobile app developments for Android and iOS. Wondering how Hostmonster stacks up against other Web Hosting companies? Enter any other Web Hosting company and we will give you a side-by-side comparison.